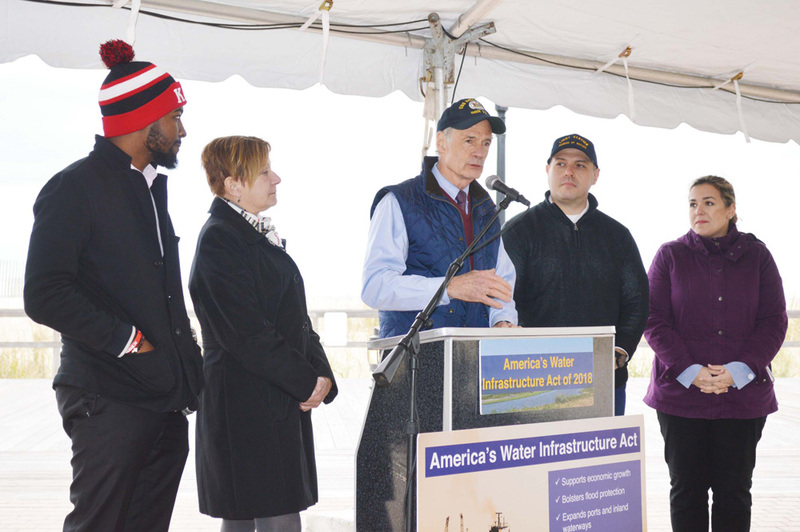 U.S. Sen. Tom Carper, center, honors his staff for two years of writing and building support for a major water infrastructure bill. 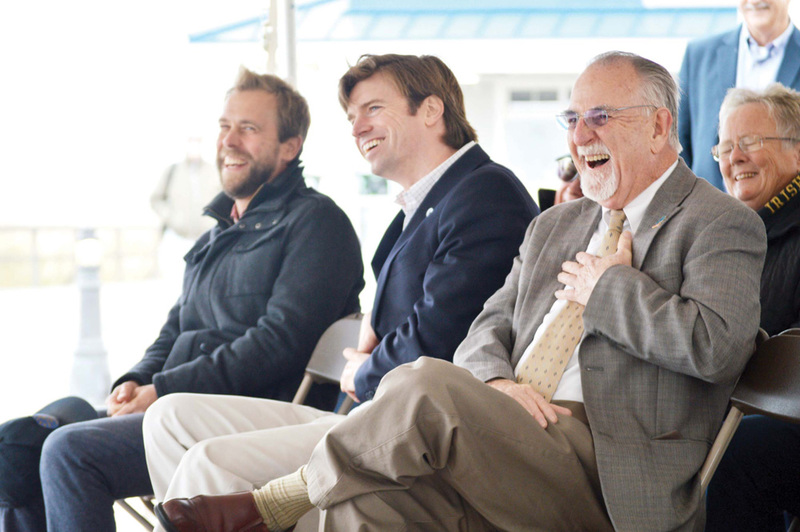 From left, Chris Bason, Collin O’Mara and Lew Killmer react to U.S. Sen. Tom Carper’s speech. America’s Water Infrastructure Act is the first major infrastructure bill to pass the 115th U.S. Congress. U.S. Sen. Tom Carper (D-Del.) co-authored the legislation, which was just signed into law in late October. Carper visited Bethany Beach and Ellendale on Oct. 26 to share the victory and explain the hundreds of millions of dollars that will be invested across the country, including locally. “I fought hard to make sure key priorities for Delaware were included in this bill, and I’m proud we were able to deliver,” Carper stated of the more-than-300-page document. Carper applauded his staff who did the legwork: two years of research, writing and reaching across the aisle to build consensus and support. This bill is for their children and grandchildren, Carper said. The law made “much-needed legislative changes to support clean drinking water systems, waterways, beaches and port projects, such as the expansion of the Port of Wilmington. It directs the Army Corps of Engineers and the Environmental Protection Agency (EPA) to make vital improvements to water infrastructure to prepare Delaware,” according to Carper’s office. Key locally is the act’s $75 million for beach renourishment. The U.S. Army Corps of Engineers can now partner for projects between regional districts, so Delaware and Maryland beaches can be replenished at the same time, versus the waste involved in having multiple contracts and schedules. The bill also expands monitoring for unregulated contaminants, such as those found in Blades’ water earlier this year, and provides new resources to help small and rural communities, such as Millsboro, to support contamination cleanup efforts for public and private wells. It also invests in infrastructure, including drinking water systems, dams, reservoirs, levees and ports, while incentivizing American-made products. “Life, liberty and the pursuit of happiness. It’s hard to have life unless we have clean drinking water,” Carper said on Oct. 26. “The legislation that was signed Tuesday by the president will help make it — whether you happen to be in Blades, Millsboro or Flint, Mich., a lot of other places around the country” — easier to get clean water, whether for a child at a school water fountain or a family getting drinking water from the tap at home. “It works in a lot of different ways. … It’s the federal government working with states, local communities and with us as private citizens,” he said. The bill was sponsored by Sen. Amy Klobuchar and cosponsored by Sen. Tina Smith (both D-Minn.). Bethany Beach Mayor Lew Killmer marveled that S. 3021 produced bipartisanship, which seems to many to be impossible lately. The bill passed the Senate on a vote of 99-1, and the House of Representatives by voice vote. “The replenishment and nourishment of beaches along the coastline here is going to provide a barrier, which provides us from protection from some of the huge damage of storms and other things that come up along the coastline — I understand there might be another one coming soon,” joked Sara Booth, president of Bethany-Fenwick Area Chamber of Commerce, glancing at the darkening skies. “This is a landmark bill in the amount of funding it is putting — not only toward beach replenishment, but to clean water in general, the amount of increase in the state revolving fund,” which helps fund water infrastructure, said Chris Bason, executive director of the Delaware Center for Inland Bays (CIB). “This is probably the most thoughtful water-resources bill that’s ever been passed by the U.S. Congress in this environment,” said Collin O’Mara, head of the National Wildlife Federation. “It was so good that no one decided to cover it, because it wasn’t folks screaming at each other on Twitter or on Fox News or on MSNBC. Carper said his next goal is to reduce carbon emissions while improving the economy, so auto-makers will have predictability in their market and fuel efficiency standards. Read the full text of America’s Water Infrastructure Act at www.congress.gov/bill/115th-congress/senate-bill/3021.